Lara Mason’s gesture forPrince HarryandMeghan Markle’sroyal weddingis really sweet, literally: It’s made with a lot of sugar. Mason, a customer service employee based in the United Kingdom, has taken up cake art as a hobby. 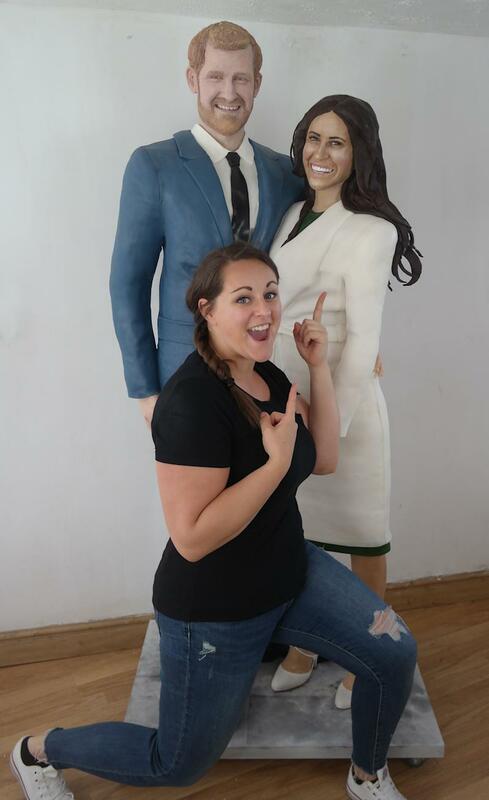 She’s been making creative cakes for about six years, and her latest project is a life-size cake ofHarry and Markle in theirengagement announcement outfits. Cake artist Lara Mason based her cake on photos of Prince Harry and Meghan Markle when they announced their engagement. Mason told HuffPost the project took “a lot of time and effort” ― about 250 hours over the last six weeks in her home’s mini studio, to be more specific. The confection she created is made of 300 eggs and about 33 pounds each of flour, butter and sugar. Mason said she used about 22 to 44 pounds of buttercream to put the cake layers together and about 110 pounds of icing for other features. 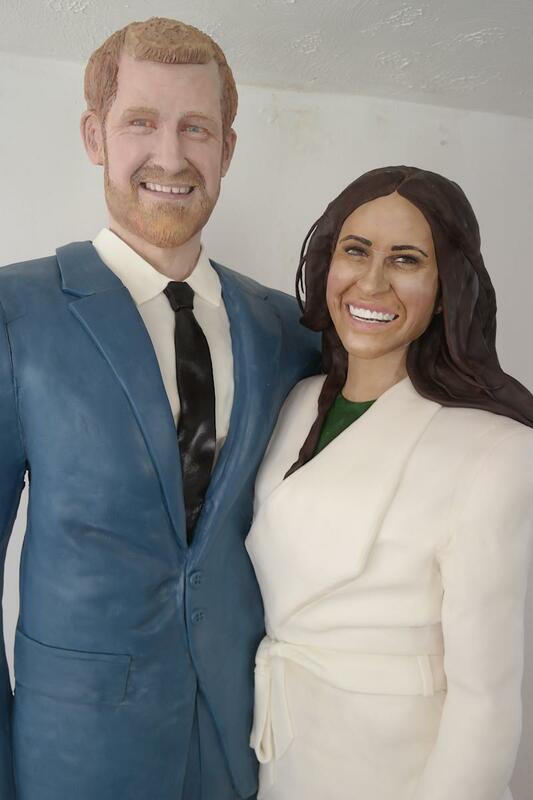 It took Lara Mason 250 hours over the last six weeks to create this life-size Prince Harry and Meghan Markle cake. The most difficult part of the project happened to be the most fun, according to the cake artist. “I do think the most difficult part was the faces, but it was also most enjoyable, because it’s where you really get a chance to get super creative at the end of the day,” Mason told HuffPost. Cake artist Lara Mason said creating the couple's faces was both the most difficult and most fun part of the process. Mason said that Cake International, a cake decorating show at the National Exhibition Centre in Birmingham, United Kingdom, asked her to make the cake as a featured showpiece that both highlights the art of baking and celebrates the upcoming royal wedding. She explained that the cake isn’t meant to be eaten ― it’s supposed to be more of “an inspirational feature at Cake International” ― but the huge dessert could serve about 500 people. A video on Mason’sFacebook page dedicated to her cake artshows how she made the replicas of Harry and Markle. She shared the footage on Friday, and it has already racked up more than 80,000 views. The life-size cake also started gaining some buzz on The Motherload’s Facebook page before the project got picked up by BBC, USA Today and People. AsThe Motherload pointed out, Mason is also the baker and mom behindlife-size cakes modeled on her twin girls that she created for their first birthday. Mason told HuffPost she's into the unexpected lemon elderflower cake the couple chose for their big day. "Your wedding, your call," she said. Asked what she will be doing during Saturday’s royal wedding, Mason said the event falls on a family member’s birthday and that she will be enjoying the televised version on a big screen with friends and family. As for her thoughts on Harry and Markle’s own wedding cake (lemon elderflower cake with buttercream), Mason said it was an unexpected choice, but she likes that they went with what they actually wanted for their big day.